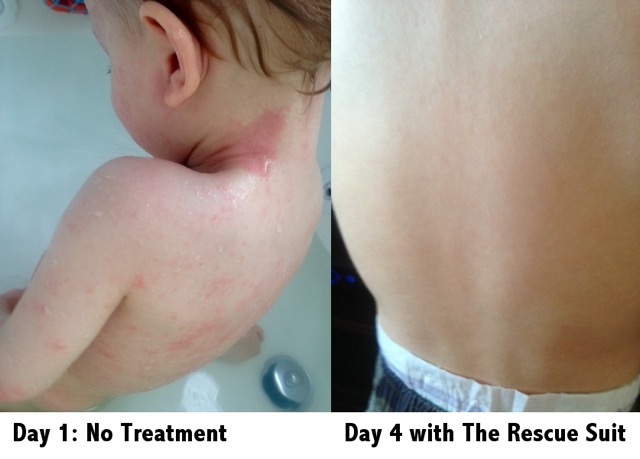 The WrapESoothe™ Eczema Suit by AD Rescuewear was carefully designed as a wet wrap treatment for eczema in children. This suit makes it a snap to dress your baby or child for dry or wet wrapping. Regular cotton garments can become stiff, baggy and uncomfortable to put on wet. The WrapESoothe™ Eczema Suit is made with flat seams and soft, stretchy fabric, making it easy to wet wrap your child and in turn heal and soothe itchy skin. The fabric stays soft and remains close to your child’s skin, making the suit more comfortable, especially with the non-irritating flat seams. Can be worn under regular clothing. Worn wet or dry, these eczema wraps will offer relief from itchy skin for young children to adults. Ideal for dry or wet wrapping elbows, forearms, upper arms, behind the the knees, calves, and thighs. Suit offers full body coverage. Flat seams and a flat fully lined zipper protect the skin from irritation. Fabric is thermo-regulated, breathable, extra soft, and smooth with a 4-way stretch. Learn more about wet wrap therapy for eczema. When wet wrapping with the WrapESoothe Suit try our 100% organic One-Piece Footed Pajamas as the top dry layer. Take a look at the full line of AD RescueWear Wet Wraps: sleeves for adults and children as well as tops and bottoms for kids. Insurance companies and Medicaid will not cover eczema "clothing" but WrapESoothe garments are classified as class 1 medical devices in the DME (durable medical equipment) category registered with the FDA and may be eligible for reimbursement via insurance. We cannot guarantee insurance coverage, so please work with your insurance company to determine eligibility. These suits are designed for wet and dry wrap therapy and are made from lightweight material specifically for effective therapy and to be comfortable under another layer of clothing. For dry wrap therapy, to maintain the quality of the suit, please cover the delicate fabric with socks, regular clothing or pajamas. Machine wash warm on gentle cycle. For best results, hand wash or use a gentle wash with a delicates mesh bag and wash the garment inside out. Lay flat to dry. Do not place in dryer.